Daiwik Hotel welcomes you to Badrinath, the ancient and sacred Himalayan tirtha that has welcomed pilgrims for centuries. If there could be a land of the gods it would be at Badrinath. This great tirtha and the ancient temple of Badrinarayan stand by a river flowing through a picturesque valley surrounded by the snow capped mountains of the Himalayas. There are four dhaams or celestial abodes dedicated to Lord Vishnu and Badrinath is the uttara or northern dhaam with Puri in the east, Dwarka in the west and Rameswaram in the south. As the most strenuous of all the pilgrimage circuits, the Chaar Dhaam Yatra is called mahaparikrama or the great circle of the land. Then Badrinath together with Kedarnath, Gangotri and Yamunotri is a shorter parikarama in the hills called the Chhota Chaar Dhaam. There is a list of 108 Vishnu shrines called Divya Desam popular in South India and Badrinath is listed in it. Badrinath is mentioned in many sacred texts like the Vishnu Purana, Skanda Purana, Bhagavat Purana and the lists of pilgrimages that can be found in the Mahabharata. 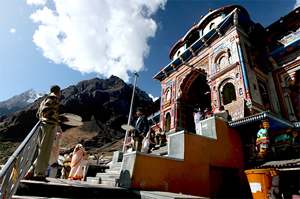 Badrinath also finds mention in the poetry of the Alvar poets of far off Tamil Nadu who sang the praise of Lord Vishnu. In Hindu mythology this is Devabhoomi, the land where the pantheon of gods and goddesses live. The Himalayas are the source of the three mightiest rivers of the Indian subcontinent – the Indus, Ganga and Brahmaputra. The River Ganga , the holiest of Indian rivers begins her journey at Gangotri and then flows across the plains of north India and ends in the Bay of Bengal in the east. Hindu mythology says that among the Himalayan peaks is the legendary Mount Meru, believed to be the centre of the Hindu universe. It also has all the heavens of the various gods – Lord Indra’s Swarga, Lord Shiva’s Mount Kailash and Lord Vishnu’s Vaikuntha. As it is Vishnu who is worshipped at Badrinath, the tirtha is also called Bhuva Vaikunth, that is, his heaven on earth. Ice capped mountains, tumultuous rivers, serene lakes, pine forests and waterfalls have all created a landscape that attracts the spiritual seeker and the adventurer. So this region has seen the presence of pilgrims, philosophers and ascetics for thousands of years. From rishis like Gautama, Kapila and Kashyapa to the Adi Shankaracharya and Ramanujacharya of the Hindus to the Sikh Guru Gobind Singh; they have all walked along these narrow hill tracks, prayed to the sun and meditated by the rivers and lakes. Badrinath is located in the Garhwal hills in the Chamoli District of the state of Uttarkhand. It stands beside the Alakananda River that is one of the main tributaries of the Ganga and at a height of 3122 metres above sea level. The tirtha stands is a dauntingly majestic landscape of soaring peaks covered in everlasting snow; emerald valleys of rice fields; apple orchards and pine forests. Here and there a silver waterfall splashes down into a verdant valley and the swift streams flow in deep gorges; frothing over boulders on their turbulent journey to the plains of north India. There are many other temples located in nearby villages including seven sacred shrines that are called Sapta Badri. Going higher into the mountains is the magnificent Valley of Flowers where just after summer a grassy valley blooms with a bouquet of wild flowers attended by hovering butterflies. Nearby is the Hemkund Lake where the tenth Sikh guru, Guru Gobind Singh came to meditate and Sikhs come on a pilgrimage to the Hemkund Sahib Gurudwara. The ancient pilgrimages called the Chaar Dhaam, or the ‘four abodes of Lord Vishnu’ refer to the pilgrimages of Badrinath, Dwarka, Puri and Rameswaram that are considered the earthly homes of the god. Each tirtha has a temple dedicated to various aspects of Lord Vishnu or one of his ten avatars. The journey called the Chaar Dhaam Yatra is the most demanding of all the pilgrimages popular in Hinduism. The dhaams are located at the four cardinal directions of the Indian subcontinent and prove that from time immemorial pilgrims have travelled across India on their yatras. Badrinath stands high in the Himalayas of the state of Uttarakhand; Dwarka is in the west by the Arabian Sea in Gujarat; Puri stands in the east by the Bay of Bengal and Rameswaram is located on an island at the southernmost tip of the peninsula in Tamil Nadu. So Badrinath is the northern or Uttara Dhaam of Lord Vishnu where he is worshipped as the Lord of Preservation. He is worshipped as one of his avatars at the other dhaams; as Lord Krishna in Dwarka, Lord Jagannatha at Puri and Lord Rama at Rameswaram. The dhaams are a part of our epic traditions and are mentioned in the Puranas. In the Ramayana Lord Ram, the seventh avatar of Vishnu worshipped Shiva at Rameswaram after he had rescued Sita by winning the battle at Lanka. The Mahabharata says that after the great battle at Kurukshetra the five Pandava brothers went on a pilgrimage to atone for the killing of their family and worshipped Vishnu at the four dhaams. There is an amusing myth of how Lord Vishnu spends his day. In the myth it is said that Lord Vishnu as the preserver of all creation visits all the four dhaams every day, thus visiting all the cardinal directions of the land. He starts his day in the north at Badrinath where he bathes in the Alakananda River that flows beside the main temple. Then he lands in the west by the sea in Dwarka and adorns himself in his golden garments and jewellery. At Puri in the east he is offered a magnificent meal of fifty six dishes called ‘chhappan bhog’. At all the temples the kind and generous deity is busy listening to the prayers of his devotees, so by the time he arrives at Rameswaram in the south he is tired and takes a well earned rest. Among the four dhaams, Badrinath has a tradition of meditation and philosophy as in ancient times sages came here and established hermitages. For centuries the spiritual seekers, the sadhus, have come to meditate in caves and worshipped the rising sun by the banks of the icy rivers. That is why another name of the tirtha is Badrikashram or the hermitage of Badrinath. It is also called Tapobhumi, the land of tapas or meditation. Here at the hermitages some of the greatest treatises were written by our scholars – the rishis and munis. 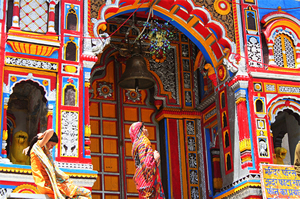 The present Badrinath Temple owes its existence to the philosopher Adi Shankaracharya who arrived here around the 8th century. He established an image of Vishnu as Badrinarayan first in a cave and then in a temple that over the centuries was rebuilt and expanded by the royal families of the region. Shankaracharya would later establish four monasteries at Joshimath, Dwarka, Puri and Shringeri that are the oldest monasteries in the land. Devabhoomi has welcomed pilgrims since time immemorial as they walked up the narrow hill tracks seeking enlightenment and bathing in the rivers in atonement for their sins. Badrinath is mentioned quite a few times in the great epic the Mahabharata. It is said that the heroes of the Mahabharata, the five Pandava brothers and their wife Draupadi came here after the terrible devastation of the battle at Kurukshetra. The Pandavas visited many shrines seeking atonement from the crime of killing their kinsmen and then walked on towards heaven. Many of the temples here have their own legends connected to the presence of the Pandavas. It is also said that Lord Krishna visited Badrinath and it is mentioned in the Srimad Bhagavat Purana. Badrinath has called pilgrims for millenniums in a land that still resonates to ancient myths and legends, temples that trace their history in centuries and a landscape that fascinates by its incomparable beauty.